Questions About our Birmingham Dog Rehoming Services? Contact our Birmingham dog rehoming team. Text or call us toll free at (888) 720-3322. We look forward to hearing from you. 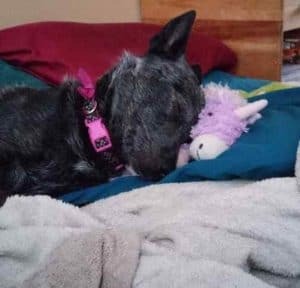 Ninja is a very sweet 2 year old female Australian Cattle Dog (Blue Heeler) Rehomed in Trussville, AL, near Birmingham. She is in great health, spayed and up to date on shots. Ninja is house broken and well behaved. She gets along very well with other dogs, and is patient and gentle with children. Ninja with her dog-buddy before the other dog began bullying her. 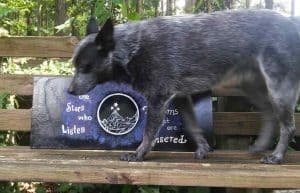 Ninja is a purebred Heeler with a very pretty salt and pepper coat and big brown eyes. She is very smart and loves to please her owner and anyone else in her midst. Ninja’s owners love her so much, but have had to make the very difficult decision to rehome her after the other dog in their home has started picking on Ninja. Her canine house mate is much bigger than her, and they are having to keep the dogs separated, a stressful situation for all. They are dearly hoping to find Ninja a loving forever home in which she will be cherished, loved unconditionally, and given the time, attention, care, nutrition and exercise she needs to live a long, happy and healthy life. They would love to keep in touch with Ninja’s new owners, but only if it is something they would be comfortable with. Such an affectionate and people-loving dog! 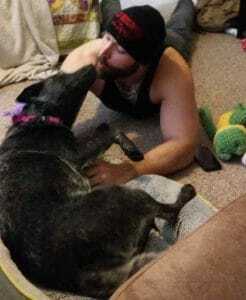 Ninja’s perfect home will be in a family who have a large, securely fenced back yard for her to play in, and the ability to provide her with companionship. Another dog-friendly dog would be the icing on the cake for Ninja. If you have been looking for a fantastic dog to join your family, please offer Ninja the home she needs and deserves today. She can’t wait to wag and wiggle her way into your heart and home. 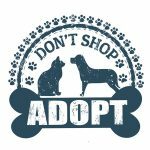 Questions about Australian Cattle Dog Rehoming Services? 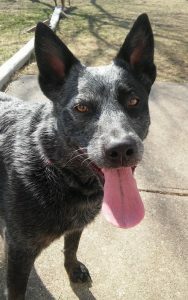 Contact our Australian Cattle dog rehoming team. Text or call us toll free at (888) 720-3322. We look forward to being of help to you. Energetic but not overly so, sweet, loves to give kisses. She is sweet and I would like this done by October if possible. Why is Ninja Being Rehomed? 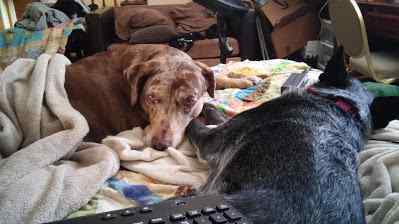 I took in this dog from a family member, and at first my territorial rescued Catahoula Hound could tolerate her, but not after I moved states. She is not aggressive, even when the Catahoula is, which is concerning and she needs a safe home. Ninja would fit in well in almost any home. She is very well behaved and has a laid back, affectionate personality. She loves children and people of all ages. She is good with other dogs, too. Ninja would appreciate a home with a securely fenced back yard. She would love a family who have plenty of time for her, and who can give her the love, attention, exercise and care she needs and deserves. Ninja LOVES going for walks in the park. If you are interested in adopting tALs special Australian Cattle Dog Rehomed in Trussville ALan, please fill out our online meeting request here. 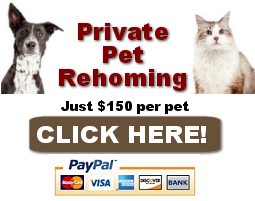 Once received and reviewed, our staff will ask the pets owner to reach out to you and arrange a meeting.